The Nonlinear and Ultrafast Fiber Optics Laboratory specialize in nonlinear optics and photonic crystal fibers, and their use for infrared frequency metrology. Our research endeavors include fiber laser based frequency combs, gas-filled hollow core photonic crystal fiber lasers, photonic microcell optical frequency references, and modelocked Tm/Ho doped fiber lasers. My publication list can be found here. My past research can be found here. The most critical agricultural challenge is to double crop production by 2050 to meet the increasing growth of global population. This must be done while simultaneously mitigating the generation of greenhouse gas (GHG) emission by agricultural sources. To solve this challenge, real time information about crop and crop resources must be measured, which will provide data that will create future breeding advances to increase crop yield. This real time information must include the detection of multiple agriculturally significant gases. Multi-gas detection is also indispensable for other agricultural investigations such as detecting GHG emissions from livestock and for crop nutrient management. Unfortunately, current technologies are a limitation for developing the necessary gas sensing technology. A revolutionary laser spectroscopic method called dual comb laser spectroscopy (DCS) offers self-calibrating, rapid field scale monitoring of multiple gases simultaneously by a single instrument. We propose the development of a mid-infrared DCS system for the detection of agriculturally significant gases. DCS stands to transform agricultural gas sensing with never-before realized spectroscopic capabilities and will serve as a next generation gas-detection platform. Resulting experiments will lead to increased crop yield in the face of growing demands on natural resources. Kansas State University, home to experts and facilities in both optical frequency combs and agricultural gas sensing, offers an excellent environment for the development of this key technological advance. An interdisciplinary team of world-class physicists and agronomists will develop a mid-infrared DCS system for the detection of agriculturally significant gases. This is a novel application of frequency combs which we hereby name agro-combs. The instrument will allow simultaneous absorption measurements of multiple gas species with sensitivity at the part-per-million level over a 10 m path. We show for the first time that an acetylene-filled hollow-core optical fiber gas laser (HOFGLAS) system exhibits near diffraction limited performance. The effect of gas pressure, fiber length, and optical pump power is experimentally determined in order to scale the laser to higher powers. The absorbed optical power and threshold power are measured for different pressures providing an optimum pressure for a given fiber length. We observe a linear dependence of both absorbed pump energy and lasing threshold for the acetylene HOFGLAS, while maintaining a good mode quality. We stabilized a prism-based Cr:forsterite laser comb and observed narrowing of the f0 linewidth from ~1.4 MHz down to ~100 kHz by changing only the prism insertion, and to 23 kHz by inserting a knife edge into the intracavity beam while keeping the same prism insertion. The noise dynamics of the Cr:forsterite laser frequency comb are investigated with the goal of explaining this f0 narrowing phenomenon. We have demonstrated a passively mode-locked Tm/Ho co-doped fiber laser that operates in both the solitonic and stretched-pulse regime by controlling the intracavity net dispersion. In the solitonic regime the laser produces 1.24 ps pulses with 9 nm spectral bandwidth. By adding a positive dispersion fiber to the cavity the laser was able to operate in the stretched-pulse regime with a bandwidth of 30 nm and duration of 450 fs. We demonstrate for the first time an optically pumped gas laser based on population inversion using a hollow core photonic crystal fiber (HC-PCF). The HC-PCF filled with 12C2H2 gas is pumped with ~ 5 ns pulses at 1.52 μm and lases at 3.12 μm and 3.16 μm in the mid-infrared spectral region. The maximum measured laser pulse energy of ~ 6 nJ was obtained at a gas pressure of 7 torr with a fiber with 20 dB/m loss near the lasing wavelengths. While the measured slope efficiencies of this prototype did not exceed a few percent due mainly to linear losses of the fiber at the laser wavelengths, 25% slope efficiency and pulse energies of a few mJ are the predicted limits of this laser. Simulations of the laser’s behavior agree qualitatively with experimental observations. A frequency comb generated by a 167 MHz repetition frequency erbium-doped fiber ring laser using a carbon nanotube saturable absorber is phase-stabilized for the first time. Measurements of the in-loop phase noise show an integrated phase error of 0.35 radians, which is a factor of three larger than that of another fiber frequency comb based on a figure-eight laser. For further investigation of stability, we heterodyned the carbon nanotube laser comb with a 1532 nm CW laser stabilized to a ν1+ν3 overtone transition of an acetylene-filled kagome photonic crystal fiber reference. These measurements resulted in an upper limit on the comb stability of 1.2x10-11 in 1 s. The carbon nanotube laser frequency comb offers much promise as a robust and inexpensive all-fiber frequency comb with further potential for scaling to higher repetition frequencies. Saturated absorption spectroscopy reveals the narrowest features so far in molecular-gas-filled hollow-core photonic crystal fiber. The 48 - 68 μm core diameter of the kagome-structured fiber used here allows for 8 MHz full-width half-maximum sub-Doppler features, and its wavelength-insensitive transmission is suitable for high-accuracy frequency measurements. 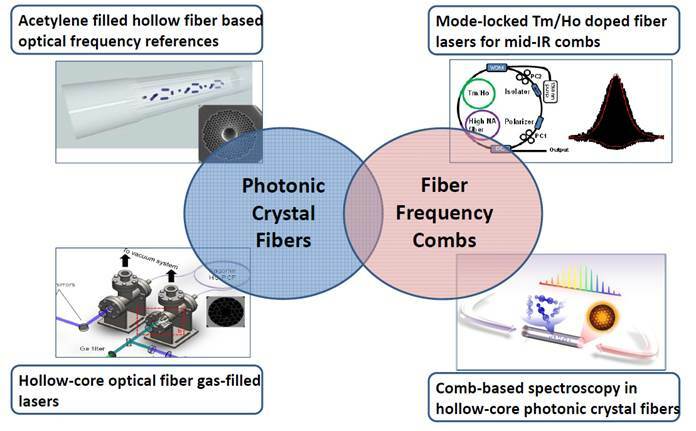 A fiber laser is locked to the 12C2H2 n1+n3 P(13) transition inside kagome fiber, and compared with frequency combs based on both a carbon nanotube fiber laser and a Cr:forsterite laser, each of which are referenced to a GPS-disciplined Rb oscillator. The absolute frequency of the measured line center agrees with those measured in power build-up cavities to within 9.3 kHz (the 1 σ error bar). The fractional stability is less than 1.2´10-11 at 1 s averaging time. Sub-33 fs, 1 nJ pulses are generated in a Er-doped fiber amplifier composed of a normal dispersion gain fiber, a low dispersion slope photonic crystal fiber, and a highly nonlinear fiber. A gas lasing medium offers advantages over solid-state materials for high power laser applications that require high electrical-to-optical power efficiency. Gas lasers offer higher power efficiency due to, in part, the higher quantum efficiency of the gas. In addition, gas lasers have superior heat management properties that facilitate demonstrations of continuous wave powers in the megawatts. Unfortunately, the drawbacks of a gas medium are in containment, efficiently pumping the lasing transition, and the small gain per unit length. These drawbacks have lead to commercial systems that favor solid-state lasers, which have tended to supplant gas lasers in many research and industrial applications. A prime example is the replacement of bulky, power-consuming argon ion lasers by small semiconductor-pumped solid-state green lasers for many scientific and industrial applications. Currently, solid state lasers offer a more compact and reliable laser at the sacrifice of lower quantum efficiency. We wish to create a new class of lasers through the amalgamation of hollow-fiber and optically-pumped-gas technologies. The new laser will have a molecular gas lasing medium in a hollow fiber that will be optically pumped using a fiber-coupled laser diode or a fiber laser. This novel laser will have the advantages of quantum efficiency of a gas medium with laser cavity that is compatible with fiber-coupled laser diodes and fiber components. Applications for lasers that that exhibit efficient electrical-to-optical power transfer are in laser ranging and missile defense. This program will also help to develop new technology for possible industrial applications such as precision machining and cutting. The results from this research will help develop high-power gas lasers in the infrared atmospheric transmission windows (3.5 to 4.1 mm). A continuous-wave laser has been stabilized to an acetylene transition inside kagome photonic crystal fiber. Stability as measured with a carbon nanotube fiber laser frequency comb to is better than 1x10-11 at 10 s.
Infrared frequency combs based on mode-locked erbium-doped fiber lasers typically require an external amplifier since the pulses directly from the laser have insufficient peak power to generate an octave-spanning supercontinuum for self-referencing. Here we implement a unique, all-fiber erbium-doped fiber amplifier that uses hollow-core photonic bandgap fiber for pulse compression. Through a combination of experiment and numerical simulations we have demonstrated temporal compression in the hollow-core photonic bandgap fiber, thus increasing the pulse’s peak power. The difficulty of fusion splicing hollow-core photonic bandgap fiber (PBGF) to conventional step index single mode fiber (SMF) has severely limited the implementation of PBGFs. To make PBGFs more functional we have developed a method for splicing a hollow-core PBGF to a SMF using a commercial arc splicer. A repeatable, robust, low-loss splice between the PBGF and SMF is demonstrated. By filling one end of the PBGF spliced to SMF with acetylene gas and performing saturation spectroscopy, we determine that this splice is useful for a PBGF cell. The frequency comb from a prism-based Cr:forsterite laser has been frequency stabilized using intracavity prism insertion and pump power modulation. Absolute frequency measurements of a CW fiber laser stabilized to the P(13) transition of acetylene demonstrate a fractional instability of ~2×10-11 at a 1 second gate time, limited by a commercial GPS disciplined rubidium oscillator. Additionally, absolute frequency measurements made simultaneously using a second frequency comb indicate relative instabilities of 3×10-12 for both combs for a 1 second gate time. Estimations of the carrier envelope offset frequency linewidth based on relative intensity noise and the response dynamics of the carrier envelope offset to pump power changes confirm the observed linewidths.